Maytag 5.8 cu. ft. capacity freestanding range is the perfect size. 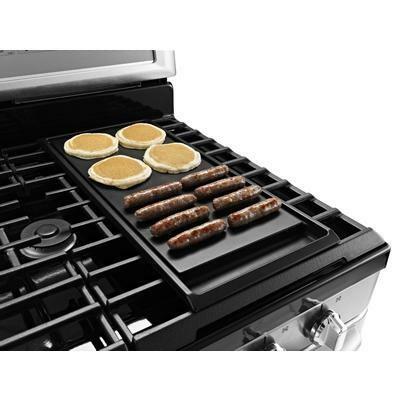 You won't know how you ever cooked without features like EvenAir™ true convection with Auto Conversion, 6-minute Power Preheat3, and a 17,000-BTU Speed Heat™ burner. And for added convenience, odor-free, low temperature AquaLift® self-clean technology helps get your oven clean in less than an hour. 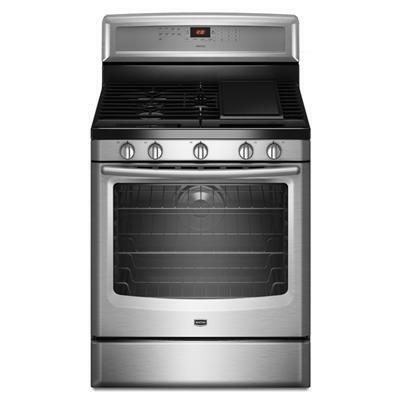 Additional Information 17,000 BTU Speed Heat™ Burner; Panoramic View Oven Window; Flex-Choice™ simmer burner; Keep Warm™ Setting; Reliable Electronic Touch Oven Controls; EvenAir™ True Convection; AquaLift™ Self-clean Technology; 3 Oven Racks (2 Standard - 1 Max capacity rack); Power Center Gas Cooktop; Integrated Griddle Burner System; Precision Cooking™ System with Precise Preheat, PreciseBake and PreciseBroil; Variable Broil. Burners/Elements Output Left Front Burner(BTU): 1,7000. 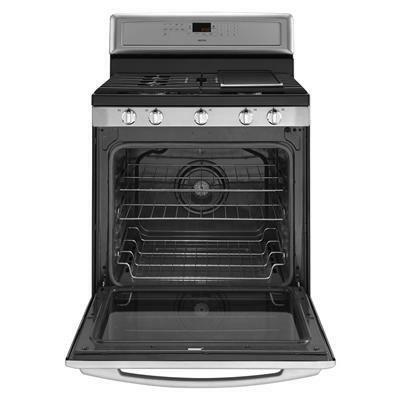 Right Front Burner(BTU): 1,5000. Left Rear Burner(BTU): 9,500. Right Rear Burner(BTU): 5,000. Center Rear Burner(BTU): 8,000. Warranty 1 Year limited parts and labor; 10-Year Limited Parts Warranty.